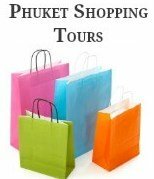 Thailand souvenirs that many travellers purchase comprise of bargains that they have bartered for in markets in Bangkok, Chaing Mai, Pattaya or Phuket. 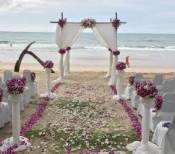 Or you may have enjoyed the experience of buying Thai handicrafts from the beach sellers along one of the beaches in Phuket. We have purchase many small bargains, as it's fun bartering with beach vendors. Some of our purchases include lamp shades, wooden elephants, Thai silk bed covers, silk bandannas that we thought were sarongs, stingray wallet and purses. A couple of my favourite purchases has been a tin Tuk Tuk that was made out of an old Pepsi can and carved soap which are displayed in wooden bowls. The picture above is of goods in an Asian home furnishings in a major department store in Phuket. Many travellers after visiting attractions like Big Buddha in Phuket, would like to take a replica Buddha statue or image home with them as a reminder of their time in Thailand. 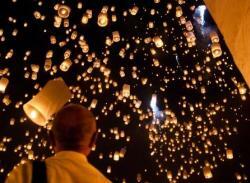 Many visitors have found out the hard way that Thailand has strict controls on Buddha images, and what they will allow to leave the country without a permit. Pocket sized Buddha images that are sold in many Thailand souvenir shops do not have any restrictions but Buddha statues of 12cm or 5 inches in height of any material, such as wood or marble restrictions do apply and an export permit must be arranged. For those special Thailand souvenirs that you maybe after, whether it be for a room at home to create your Asian home décor theme. 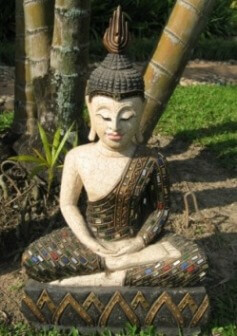 Or to find that large Buddha statue or Buddha for your garden, you will need to look at finding a local store to buy and export your unique gift. But before you do you should read more about exporting Buddha images and statues from Thailand. Just beware some shop owners will sell Buddha images and not alert you to the requirements under Thai law, before you buy read our guide on Shipping from Thailand. By far the easiest way to buy those unique Thailand souvenirs is to buy your Buddha statues that already have export permits in place. 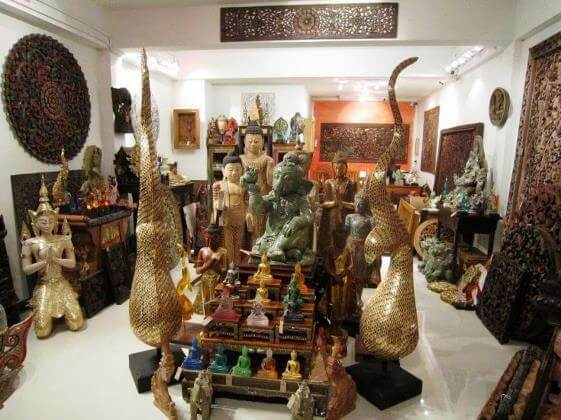 The following is a select range of Thai Souvenirs from a trusted supplier in Phuket, that we have personally used ourselves to import Buddha statues and one of our favourites the kneeling Teppanon Angels into Australia. 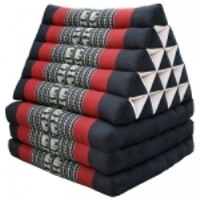 Thai triangle pillows are one of the most popular Thailand Souvenirs. The traditional Thai pillows have been used for many centuries in Thai homes and are still used today. 12" Lap: Measures 22" High, 12.5" wide, and 6" deep. 16" Lap: Measures 28" High, 16.5" wide, and 10" deep. Weighs approximately 10, 15, 25 lbs, respectively. Can be custom ordered in larger sizes. 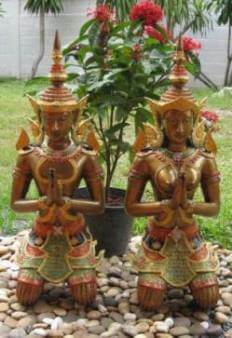 Pair of Male & Female Kneeling Teppanom Mythology Angels. Intricately hand moulded from wax, hand stained and finished in Thailand. The angels weigh approximately 35, 25, 10, 2 lbs each statue respectively and can be custom ordered in larger sizes. The Kneeling Teppanom Angels are available in Brass or Silver and if you prefer a little colour they are also available in a Multi-colour. 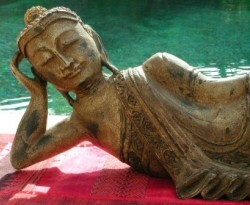 Hand carved reclining Buddha is intricately carved in Thailand from rain tree (monkey) wood with antique finish. Measures 25" wide, 9" high and 6" deep. Weighs approximately 10 lbs. Colour and weight variation due to the nature of the wood. 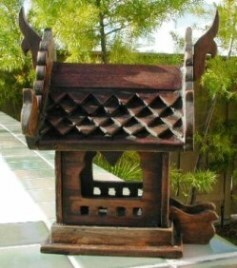 The Hand carved X-Small Thai Spirit House is intricately carved in Thailand from teak wood with traditional roof and adjustable horns. 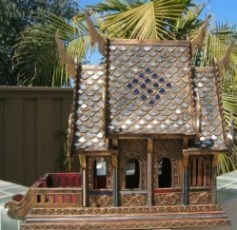 The Hand carved Thai Spirit House is intricately carved in Thailand with decorative glasses finish and adjustable horns. Measures 19" long, 18" high, 11" wide from horn to horn. Weighs approximately 8 lbs. This particular spirit house cannot be placed outdoor.